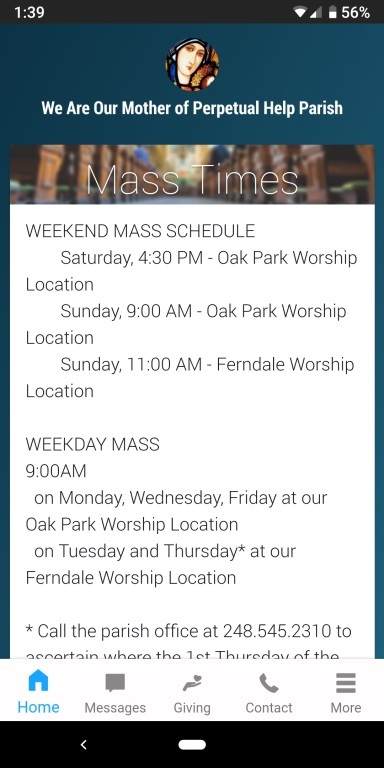 Through the Parish Mobile App we hope you become more engaged in the parish. We can now connect with you wherever you may be. You will have easy access to phone and email contacts so you can get more involved. You will be able to choose to receive messages from the commission, councils, and parish organizations you may be interested or involved in. We will be able to send out to you important messages instantly for things like church closings due to weather or urgent prayer requests as well as notifications for upcoming events or Mass times for a holy day of obligation and more. The weekly bulletin will automatically be delivered digitally to you on your phone or tablet. You will have easy access to our events calendar so you can choose to participate more fully in the life of our parish. Our calendar shows you where you can find a place to belong, engage, grow, and give back. You will have the opportunity to donate to our church right in the palm of your hand. The online donations button is on our app homepage, so you will be able to share your gifts with our parish on your phone. You will have easy access to daily readings from the United States Conference of Catholic Bishops (USCCB). How Do You Get the App on Your Phone or Tablet? Please consider donating a live flowering plant for Easter. Choose something (Easter lilies, small flowering trees, hydrangeas, orchids, peace lilies or other flowering plants) that has special meaning to you or someone you love. Plants/flowers may be dropped off at either worship location beginning Palm Sunday weekend through the morning of Good Friday. The Blessing of the Easter Food is a grand event during the quiet of Holy Saturday. The Creed says that Our Lord, “descended into hell” before he rose from the dead. The quiet of Holy Saturday recalls this reality. Our churches reflect the terrestrial and temporal reality that Our Lord is still not with us—there is a special silence. Yet amidst this silence, our parishioners meet with Fr. Paul, our Pastor, and present their baskets of food for the Easter feast to be blessed. Observing the beautiful foods and creations of other parishioners is one of the special joys of the event. From a Christian perspective, Easter eggs are said to represent birth, new life, and Jesus’ emergence from the tomb and resurrection. Decorating eggs for Easter is a tradition that dates back to at least the 13th century. One explanation for this custom is that eggs were formerly a forbidden food during the Lenten season, so people would paint and decorate them to mark the end of the period of penance and fasting, then eat them on Easter as a celebration. As has been our long standing tradition please remember to bring a candy or decorative Easter Egg (due to food safety concerns please do not bring actual or hardboiled eggs) to share at the sign of peace. Our egg exchange represents the sharing of new life and our Easter Joy as we celebrate the Resurrection of Christ our Lord with each other. Make sure to get a substitute if you are unable to serve at your scheduled Mass. Please make sure that you check in with your coordinator and pull your tab. This is especially important if you are substituting for someone. If you are not scheduled to serve but are at Mass please, check in with the coordinator in case assistance is needed. If you are a lector please make sure in your preparation to read all of the readings for your scheduled Mass. The readings are listed on the index which was prepared for you. If you haven’t picked one up please stop by the sacristy and get one. If you are a bread or wine minister please make sure to use hand sanitizer before distributing communion. Liturgical Ministers are requested to dress in business casual. Thank you for your service to the parish! The Monday Morning Prayer Group meets on most Mondays at 10:30 AM in the Gathering Area at Our Lady of Fatima Church. Over 50? Looking for something new? Join the 50+ Club at their meetings on the first and third Thursday of every month in the Gathering Area at Our Lady of Fatima. The meetings are always lively. Come to the meeting and find out about all the great events they have throughout the year. It has been a while since the Women’s Society last met. Pizza and salad will be provided as well as some light desserts. All women of the parish are invited to attend. A BIG THANK YOU to everyone who attended our Lenten Soup Supper! Through your generosity we were able to contribute $639 to the St. Vincent de Paul Food Depot. The evening was delightful and our speaker from the Food Depot was very interesting and informative about the wonderful work the Food Depot does to assist the clients who are served. The delicious soup was provided by several members of our Men’s Organization and the Traffic Jam and Snug restaurant in Detroit (Thank you to Fr. Paul for picking up the soup from TJ’s). Star Baker on Coolidge in Oak Park once again donated their excellent bread. We appreciate and are grateful to all who contributed to make this year’s annual Soup Supper successful. During the Lenten Season, a baby crib will be set up at both worship locations to collect new and gently used baby items (newborn - 1 year). These items will be collected for mothers in need. Thank you for your generosity. 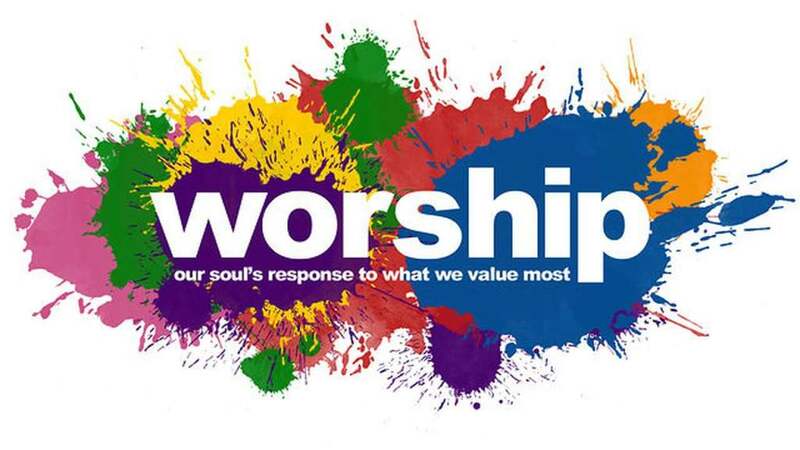 Coffee hour 1st at our Ferndale Worship Location and 3rd Sundays of the month at our Oak Park Worship Location. Come join us for coffee, doughnuts and blood pressure checks. The Parish Nurse Committee is looking to recruit parish nurses or other medical professionals to offer blood pressure readings the first Sunday of the month at Ferndale Worship Location and the third Sunday of the month at Oak Park Worship Location during Coffee Hour. The Peace and Justice Committee is sponsoring the "Strangers No Longer Retreat" on Saturday, April 13th from 10:00 a.m. to 3:00 p.m. This retreat will be a time for prayer, reflection, community and next steps for immigration support and advocacy. Want to get involved with a new group and help others? If so, why not attend our next meeting. Our spring Bundle Days event will be held May 18th and 19th. The pod will be in our Oak Park Worship Location parking lot only. Do some spring cleaning in your closets, basements, etc. This is a wonderful way to share of all the extras you have gathering dust. All clean reusable items are appreciated i.e. ; linens, towels, bedding, clothing, small appliances, small furniture, etc. For larger furniture, please call 313-673-7837 for pickup. Your surplus may be someone's necessity. Food Depot Needs Our Help! The food depot is in desperate need of household cleaning items and paper products. Our clients are not able to purchase these items with their Bridge Cards as they may only purchase food items. We all know how necessary these products are to a household. Please bring what you can and place it on the table in the gathering area. Your generosity and compassion for our less fortunate neighbors has been and continues to be overwhelming and is deeply appreciated. 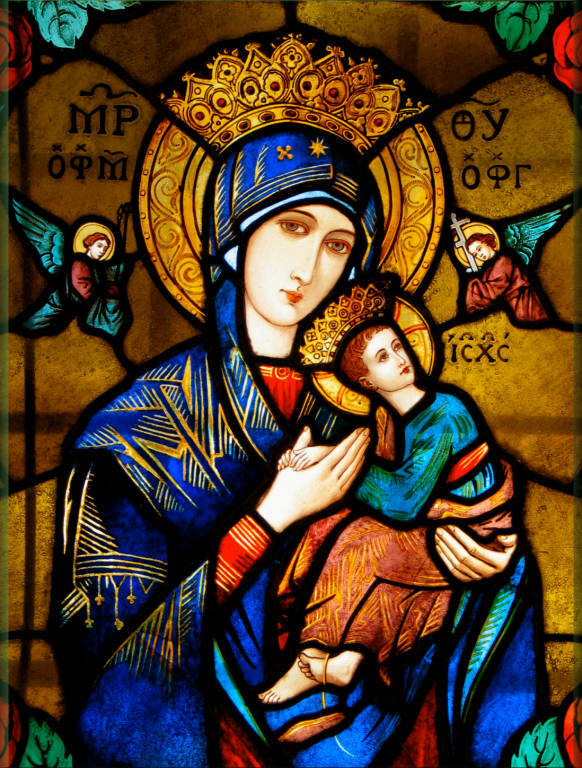 The Finance Council is pleased to announce that you are now able to submit your offertory contributions, if you choose to do so, to Our Mother of Perpetual Help Parish online. Visit our donate online page on this website. What does this mean for you and our Parish? ¨ There is less cash for the counting teams and office to handle and easier bank deposits. DO YOU HAVE A NEW PHONE NUMBER(S)? If you or a loved one is home bound, in the hospital or a nursing home and would like to receive Holy Communion, please call the parish office at 248-545-2310. A parish member would be happy to visit you. DO YOU KNOW ABOUT OUR WELCOME DESKS? After each weekend liturgy there is a volunteer at the Welcome Desk at both sites of Our Mother of Perpetual Help Parish. We extend a big thank you to all of the volunteers, our fellow parishioners, who dedicate their time to serve in this important ministry. If your recognized parish organization has an event you would like placed on the parish calendar (so that it appears on the website and the calendar of events in the bulletin) you must complete an event form. Forms may be obtained at the parish office and must be returned to the parish office at our Oak Park Wroship location or submitted via email to omoph2@gmail.com. There should not be more than one event scheduled at the same time. No events should be scheduled on Holy Days of Obligation or during Holy Week. PLEASE NOTE: Your event is NOT scheduled until you receive a confirmation. 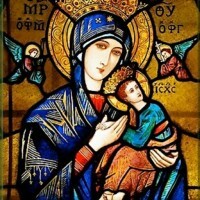 Did you know that you can submit an article for the Our Mother of Perpetual Help News or request a Mass Intention through the on-line parish forms. Go to the "Information regarding on-line parish forms" and make sure to read the information regarding submitting the forms. Then go to the subpage to find the forms, complete and submit.